Four fifth graders from Fairmont's Mable Campus demonstrated their talent for scientific innovation in Toshiba’s national ExploraVision Competition. The team, led by science teacher Kathryn Baham, was named one of 24 regional winners in the country and will now take their project “Hearing the World’s Silent Side” to the national round of the competition. The team members include Chloe S. of Fullerton, Taylor T. of Orange, Riya B. of Buena Park and Raj S. of Anaheim. The ExploraVision competition challenges fourth through sixth graders to propose how a current technology might be used 20 years in the future. Fairmont’s team of students studied the cochlear implant (hearing aid) and was shocked to discover that with today's technology doctors are still unable to help patients with deafness caused by auditory nerve damage. To find a solution, the students looked to the technology that is currently being tested for spinal cord injuries and wondered if that technology could be re-purposed in deaf patients. The answer, it turned out, was yes. Applying this creative thinking, the students came up with their product: “Hearing the World’s Silent Side” [HWSS]. HWSS is a mixture of two components: nanofibers used in Spinal Cord technology and a 2012 Cochlear Implant. In HWSS the nanofibers are used to coat the auditory nerve. When sound waves enter the ear they are able to bypass the nerve damage. Combining this nanofiber technology with the regular cochlear implant results in a perfect solution for any type of hearing loss. "I am so proud to be coaching this team of students. They are innovative thinkers who explore new ideas with enthusiasm. Cochlear implants and spinal cord procedures are complicated technologies to understand, but these students did their research and became experts on the topic, because they had a passion for helping the deaf to hear," said Kathryn Baham, Fairmont Mable Campus Science Teacher and ExploraVision Coach. Each of the regional winning teams receives a Toshiba laptop for the school and each member of the regional winning teams will receive a Toshiba HD Camcorder. Toshiba will visit the Mable Campus to recognize the students in an awards ceremony on Thursday, March 22 at 2:00pm. Each of the regional winners will now move on to the national phase of the competition, where they will compete to be named among the eight national winner teams, including four first-place and four second-place winners. Students on the four first-place ExploraVision national winner teams will each receive a $10,000 US Series EE Savings Bond valued at maturity. Students on second-place teams will each receive a $5,000 Savings Bond valued at maturity.The eight teams will also receive an expenses-paid trip with their families, mentor, and coach to Washington, DC for a gala awards weekend in June 2012. Activities will include a visit to Capitol Hill to meet with members of Congress, a Science Showcase during which the students will display and demonstrate their winning ideas, and sightseeing around the nation’s capital. 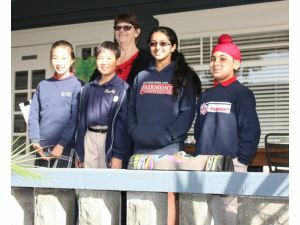 2010: 2nd Place Nationally for Automatic Correcting Eyeglasses by John W. and Valerie N.
2009: Regional Winner for The Smart Cane by Tera G., Justine G. and Victoria N.
Read the story in the OC Register and Parenting OC.